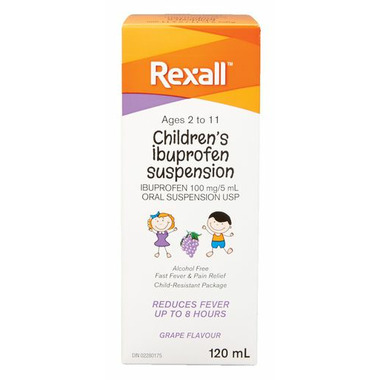 The Rexall Children's Ibuprofen Suspension Liquid is an alcohol free, fast fever and pain reliever. It features a child-resistant package, a delicious berry flavour and it can reduce fevers up to 8 hours. Dosage: SHAKE WELL BEFORE USE. Use enclosed dosage cup. If possible, dose according to body weight. Read leaflet for important information before use. Single dose may be repeated every 6 to 8 hours as needed. Do not exceed 4 doses of ibuprofen per day, unless advised by a physician.